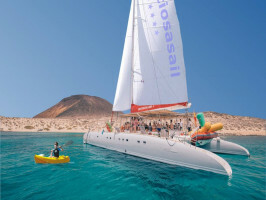 The fun starts as we make the crossing from Orzola on Lanzarote by ferry. 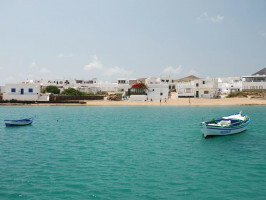 Once we arrive at Graciosa you'll have an hour to explore the island's main settlement, Caleta de Sebo. There are no roads here and very few cars and the landscape is stark and strangely beautiful. 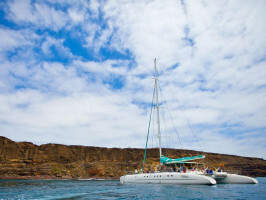 Then we'll board the catamaran and start our voyage around the island. In the distance you'll be able to see the neighbouring islands of Montaña Clara, Alegranza, Roque del Este, Roque del Oeste and several other islets. 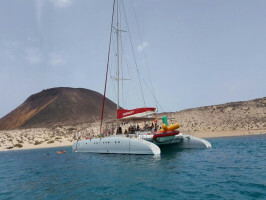 After sailing for around an hour we'll drop anchor at the beach of Montaña Amarilla where you can enjoy a dip or some snorkelling in the pristine turquoise waters. Meanwhile lunch will be served. Choose from pasta, salad, bread and butter and fresh fruit as well as unlimited wine, beer and soft drinks. 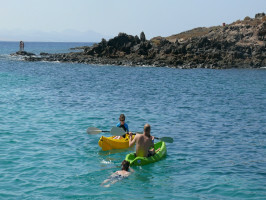 Then we'll continue our voyage, passing the incredible beaches of La Francesa and Las Conchas. You'll also get magnificent views of the island's many cratered volcanoes. Finally we'll dock at La Caleta again, where you will have more free time to explore or just enjoy the quiet pace of this tiny settlement before catching the ferry back to Orzola.